RANSOMVILLE, NY – July 27, 2018 – David Gravel fought off multiple charges from Brad Sweet to lead all 30 laps and claim his fifth win of the 2018 World of Outlaws Craftsman Sprint Car Series 40th Anniversary Season at Ransomville Speedway. Sweet took the lead on two occasions but settled for second for the second consecutive year at Ransomville. Polesitter Donny Schatz completed the podium. Donny Schatz won the Sears Craftsman Dash, earning the pole for the 30 Lap Feature, in search of his 16th victory of the year. Action was halted on the opening lap after Paulie Colagiovanni went for a wild ride up and over the turn three and four wall. Colagiovanni was uninjured and walked away from the incident under his own power to a large roar from the massive Ransomville Speedway crowd. David Gravel powered around Donny Schatz to pace the field down the backstretch and lead the opening lap. Brad Sweet went around Schatz to take second on Lap 3. Another Red Flag halted action as Daryn Pittman got upside down battling for position inside the top ten on Lap 4. Pittman walked away from the incident under his own power. A long stretch of Green Flag laps allowed Gravel and Sweet to reach heavy lapped traffic. The duo sliced and diced through slower cars littered around the 3/8th mile. Sweet cleared Gravel with a slide job on Lap 10, but Gravel turned back underneath to edge Sweet at the line. As the duo continued to navigate traffic, Sweet edged in front of Gravel once again down the backstretch on Lap 17, but once again Gravel willed his CJB Motorsports No.5 back in front at the stripe. One lap later the final caution of the night flew for an ailing Dan Bennett, taking the leaders out of traffic with 12 laps remaining. Gravel motored away with a clear track in front of him. Gravel would be forced to clear a pair of lapped cars running side-by-side and he did so with relative ease, axing any chance of late race heroics from Sweet. “I was being a little cautious, I blew a tire here last year and I didn’t want to do that again this year. When Brad showed his nose, I knew I had to step up my game and luckily, I was able to get back by him,” Gravel said in Victory Lane. “We’ve been fast here the past couple of weeks, it’s good to get another win. This is our first win in a CJB house car, Barry [Jackson] has put a lot of hours in to make these things go fast,” Gravel added. Sweet settled for second and complimented Gravel. “David did a nice job getting through traffic, especially with the lapped cars battling side-by-side. I think we were pretty equal with him, my guys gave me a great car,” Sweet said next to his Kasey Kahne Racing No.49. After starting on the pole, Schatz was disappointed to fade to third, but made no excuses. “We weren’t good enough to compete for the win, you lick your wounds some days and come back stronger,” Schatz said before thanking his crew for their continued effort. Kraig Kinser had a season-best fourth place finish with Logan Schuchart completing the top five. 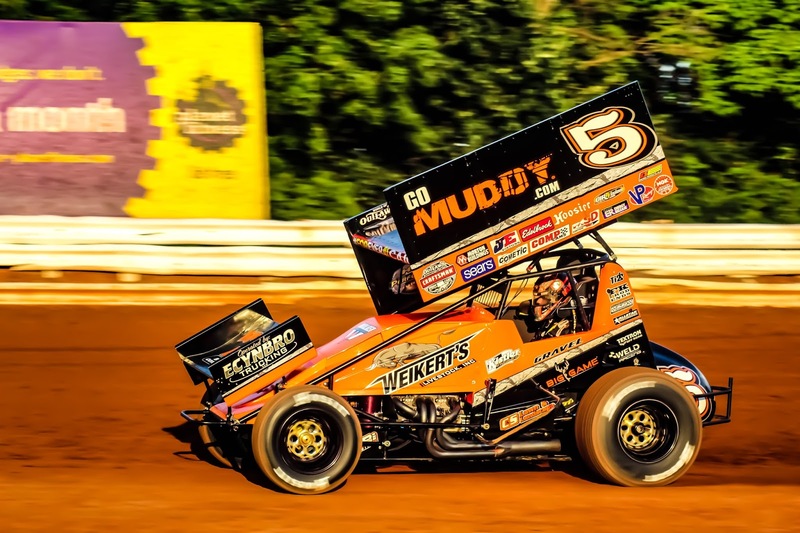 The World of Outlaws Craftsman Sprint Car Series continues its 40th Anniversary Season Sunday, July 29 at Weedsport Speedway with the Empire State Challenge. Following that, the Series will head to Pevely, MO for two 55-lap, $20,000 to win Ironman 55 Features at Federated Auto Parts Raceway at I-55! If you can’t make it to the track, be sure to watch all the action LIVE on DIRTVision.com!